Due to the recent release of the final RTM version of Microsoft Office 2016, corporate customers can migrate to a new MS Office platform. 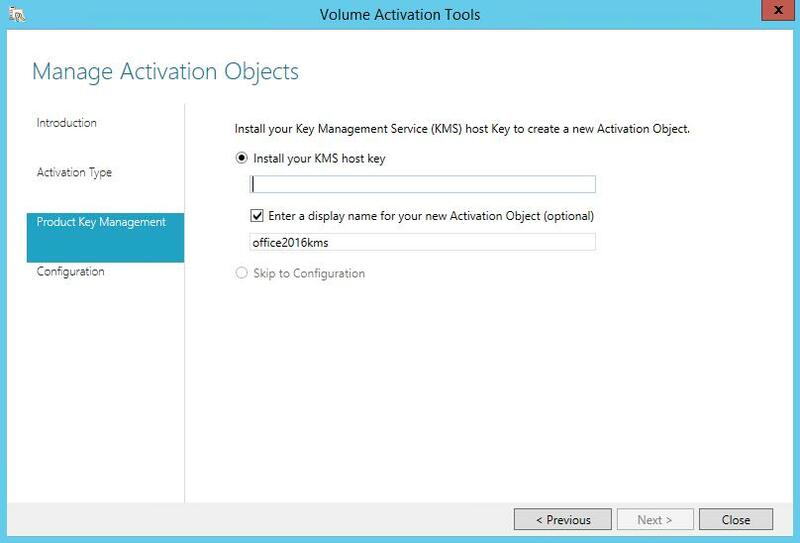 In this article we’ll deal with the peculiarities of MS Office 2016 activation on a corporate KMS server (FAQ: Understanding MS Key Management Service). It is supposed that you already have the deployed KMS server on Windows Server 2012 R2 or other Windows versions (see the list of the supported operating systems below). Corporate customers can activate Office products inside the corporate network without connecting to Microsoft activation servers in the Internet by using the KMS server. Earlier we have already considered the peculiarities of KMS activation of MS Office 2013, and the main principles and approaches to the MS Office 2016 activation on a KMS server stayed unchanged. This guide applies only to corporate (volume) Office 2016 editions and doesn’t cover Office 365 ProPlus, managed via the subscription. KMS for MS Office 2016 doesn’t activate previous Office versions (Office 2010 and 2013). 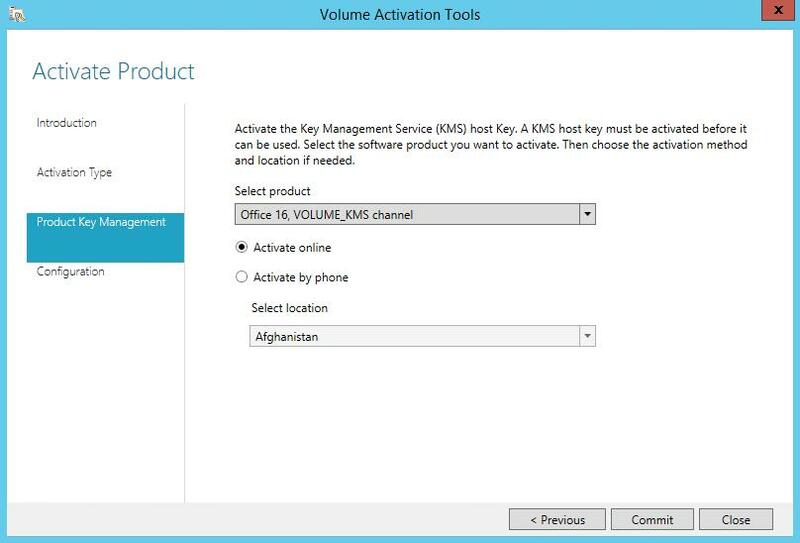 To activate previous versions of Office on the KMS server, you need to install the appropriate volume license packs and activate them with own key. Windows Server 2016 (there are some problems with it – see the last section of the article). Activation through the domain – ADBA (Active Directory-Based Activation), requires the domain functional level at least Windows Server 2012. 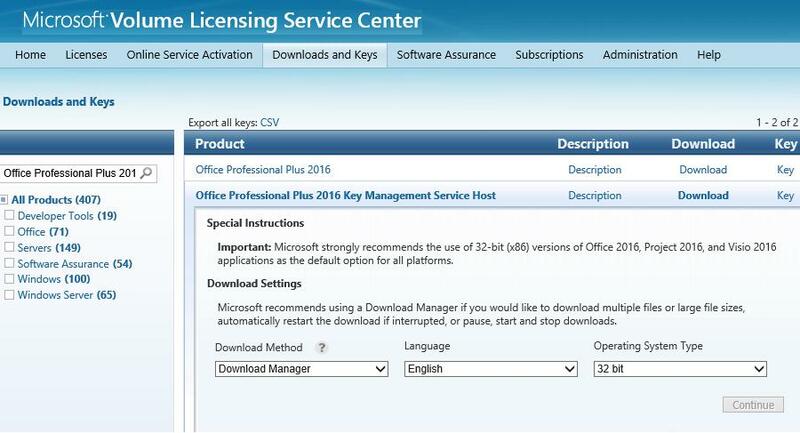 First of all, you have to find and copy a KMS Host key for Office 2016 in your personal section on Microsoft Volume Licensing Service Center (VLSC) website. On the next step download the KMS extension package — Microsoft Office 2016 Volume License Pack (https://www.microsoft.com/en-us/download/details.aspx?id=49164). 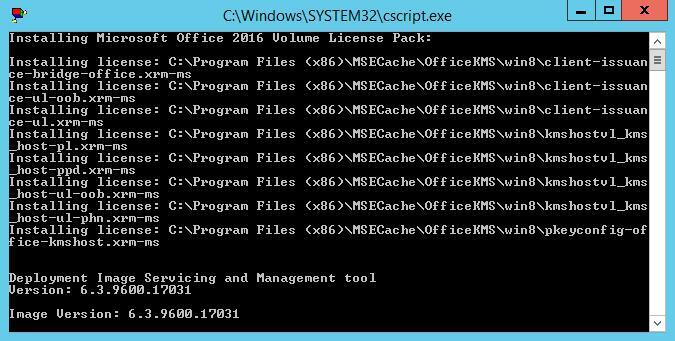 Run the file you have downloaded (office2016volumelicensepack_4285-1000_en-us_x86.exe) on your KMS server with administrator privileges. During installation the Volume Activation Tools window appears, where you have to select the activation type (KMS or ADBA). Both options are described below. If you are going to use the standard KMS activation, select Key Management Service, specify the FQDN name of your KMS server and the KMS Host Key you got earlier. Then select the activation method: online or by phone. In the first case you will have to temporary provide your KMS server with the direct Internet access. After your KMS server is activated on Microsoft, the current KMS server configuration is displayed. In the product list, the entry Name: Office 16, VOLUME_KMS_channel with the licensing status Licensed should appear. Exit the wizard, and Software Protection service will be restarted. 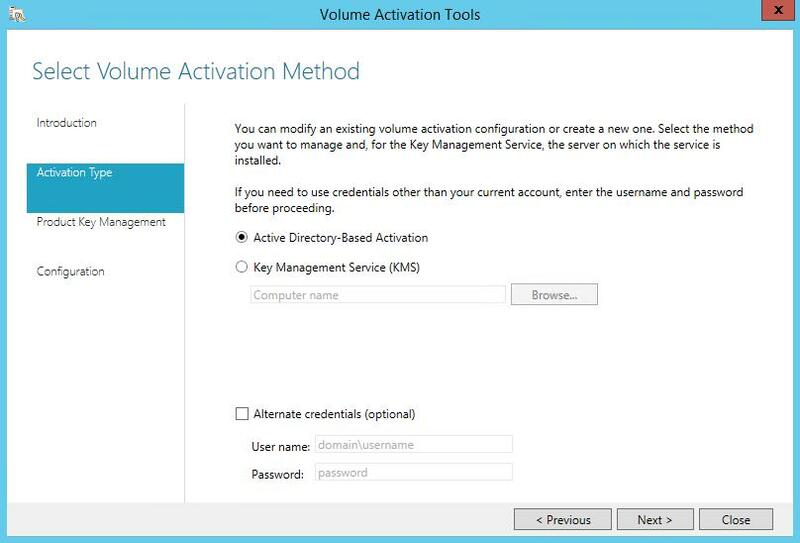 If you are going to use Active Directory-Based Activation for the automatic activation of Office 2016 on the computers in the AD domain, select Active Directory-Based Activation as a volume activation method in Volume Activation Tools. This activation method works only for Windows 8.1, Windows Server 2016 / 2012 / 2012 R2 and Windows 10. Then you have to enter the same KMS Host key (CSVLK) and specify its name (optional). Now you only have to activate your KMS key. A warning that a new object will be created in the AD forest appears. Therefore, to properly install the KMS server for ADBA activation, you will need Enterprise Admin privileges. 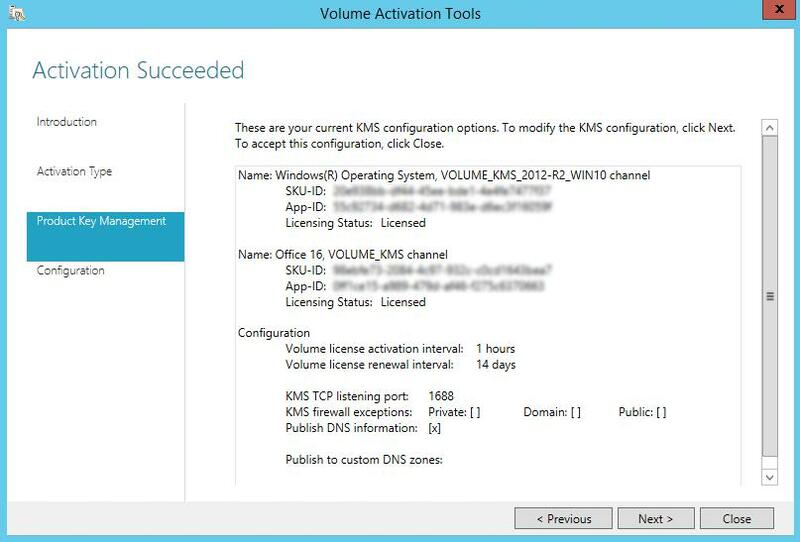 Now this KMS server is ready to activate clients with Office 2016 joined to the Active Directory domain. On the users’ computers, you need to install a special corporate edition of MS Office 2016 product (you can download it from the personal cabinet of the Microsoft volume licensing site – VLSC). In this editions, a special GVLK key is preinstalled and after installation of such MS Office 2016 copy, it automatically tries to find the KMS server in the domain through a special DNS record (however, you can change the key from the usual Office version installed with the retail, MAK or OEM key). Note. In order the KMS server to start activating clients, it has to receive at least 5 product activation requests from the clients (activation threshold). The information can be found in the KMS section of the event log (look for the Event ID 12290). All corporate Office 2016 versions are installed with Generic Volume License Keys (GVLK). These keys are public and accessible to everyone on the Microsoft TechNet. Due to them, all product versions are automatically activated if there is the KMS server in the network. So, as a rule, you don’t need to enter your GVLK. Vmw.exe has stopped working. A problem caused the program to stop working correctly. Windows will close the program and notify you if a solution is available. I’ve met somewhere before that VAMT currently supports all operating systems, up to Windows 8.1. And when installing the KMS server role on Windows Server 2016 or Windows 10, the executable file Vmw.exe crashes. Now your KMS server based on Windows Server 2016 is activated and can be used to activate clients. Thanks Donald; it works perfectly. I think the link was deleted. It was a very good website indeed. Do I have to have Office 2016 installed on the computer that is running the KMS? When I run the cscript, it says everything is fine, and it opens the Volume Licensing Tool, but the tool doesn’t give me the option to choose a product, and although it accepts the Office key, I don’t see any change in the products being managed. This is a 2012 r2 server that is working fine for activating Windows 7 work stations. 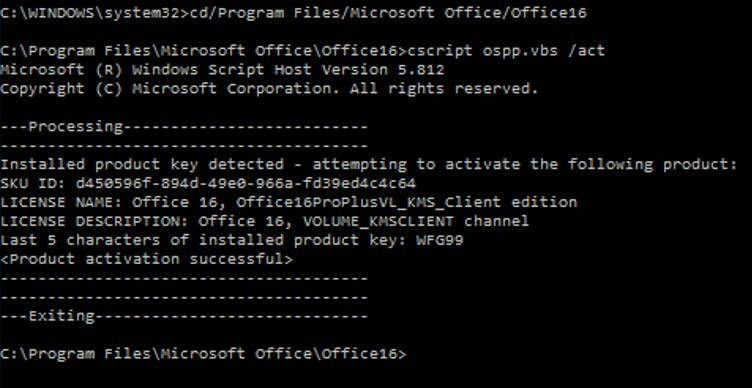 I have been told that I can be running the KMS activation for Office on the same server as for Windows, but is that not correct? It’s a file server and secondary domain controller, so naturally I don’t have Office installed. Thanks for the great article, my question what if i need to activate just Visio and Project without all office apps shall i will use the same procedure or it will be different? If i have an environment of 100 workstation that I reimage every 6 months and i only have 120 VL of office 2016. When I activate the 100 workstation, I will use up the 100 licenses but what if i reimage the computers on the 6 months. What will happen? will only 20 computers be activated or all 100 computers of office 2016 be activated? Admin. thanks for the reply. Assume I setup KMS server correctly, Is the KMS smart enough to count that I just have 100 computers with office that I reformat/activate all the time so its still 100 licenses compare to a kms counter that just keeps increasing? if so, then this article should be a great start for me, correct? KMS servers don’t check the number of licenses you have purchased. You could have 100 licenses and can activate 1000 computers against it. It’ll activate them all. Now if organization has Office365 , wants to deploy office2016 using KMS host and client running server 2012 r2 – rds/ citrix environment how activation & licensing works..
Citrix for publishing office 2016 thru Xen App 7.x ..
Quick question which you may be able to answer for me. We have an environment with 1000 computers. We have purchased 800 licenses initially of Office Standard 2016 and using KMS with VAMT 3.1 they activated fine. We then went and got a further 180 licenses, but we got a different KMS and MAK key for the new 180. 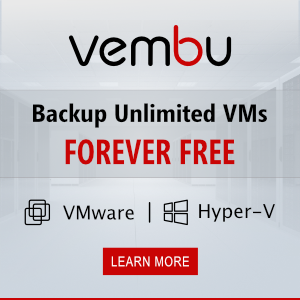 Your old KMS server can activate unlimited number of Office 2016 copies. thank you. I have a Windows 2016 Server. Was working good. Hi thanks for this article. I need to migrate from Office 2010 to Office 2016 on 2 X 2008R2 RDS Server with 20 users each. Do I need to install first Office Pro Plus 2016 on both servers and, when it’s done, install the KMS host server ? Or Do I have to setup the KMS host server first and then install Office 2016 ?